I don't know about you guys, but when I find a great drugstore product I grip tight and never let it go! I've managed to find three base perfecting products which I ALWAYS repurchase as soon as they run out, for a mere £15. The first of these products was my first ever make up purchase and I've rarely been without it (I did however, have a brief affair with the Mac MSF Natural). The Rimmel Stay Matte Powder is genuinely the best setting powder I've ever used and for just £3.99 it's an absolute bargain. I always get the Transparent 001 one as it does not alter the colour of my foundation and the formula keeps me matte for a large proportion of the day without looking cakey on the skin. This is a godsend if you have oily/combination skin! The second is another Rimmel product, the Lasting Finish 25hour Foundation. This has to be my sisters number one make up product of all time, she literally recommends it to everyone. 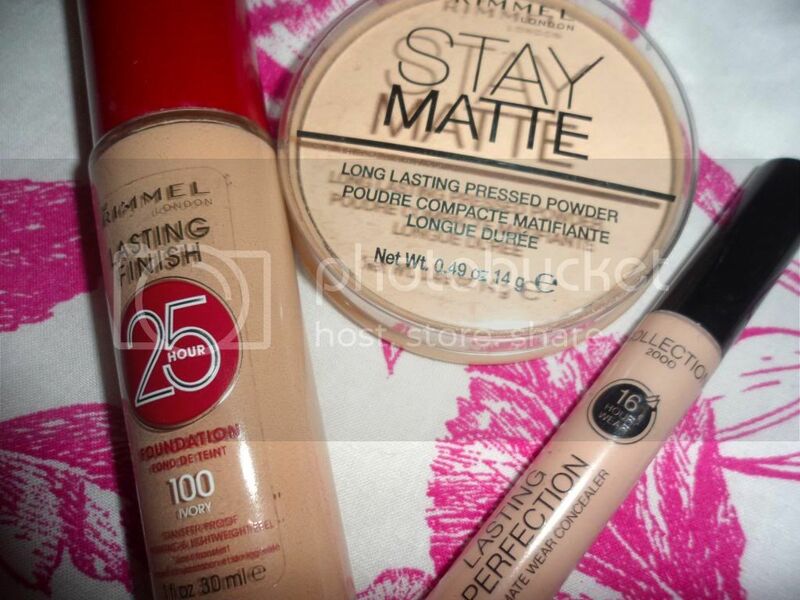 To be honest, I love almost all of the Rimmel foundations and you can't really go wrong with them. This one has the most coverage and lasting power of the whole range the offer and that makes it perfect for my blemish prone and uneven skin tone. It covers as multitude of sins, blends well, comes in a good range of 6 colours and does NOT budge all day. The final product has become a cult product amongst beauty bloggers and as a result it's always sold out in my colour (meaning I stock up as soon as I find it!). The Collection Lasting Perfection Concealer is a liquid concealer with a doe foot applicator. I get shade 2 to cover imperfections and shade 1 for under the eyes. I do think it is a little thick to use under the eyes, but I mix it with my Origins GinZing so it's a little more light reflecting and not as heavy. This stuff is seriously heavy duty and will cover anything so it's perfect for bad skin days and nights out for a flawless finish. They're amazing aren't they!?! I always use these three when i'm having a bad skin day or want an extra flawless base.